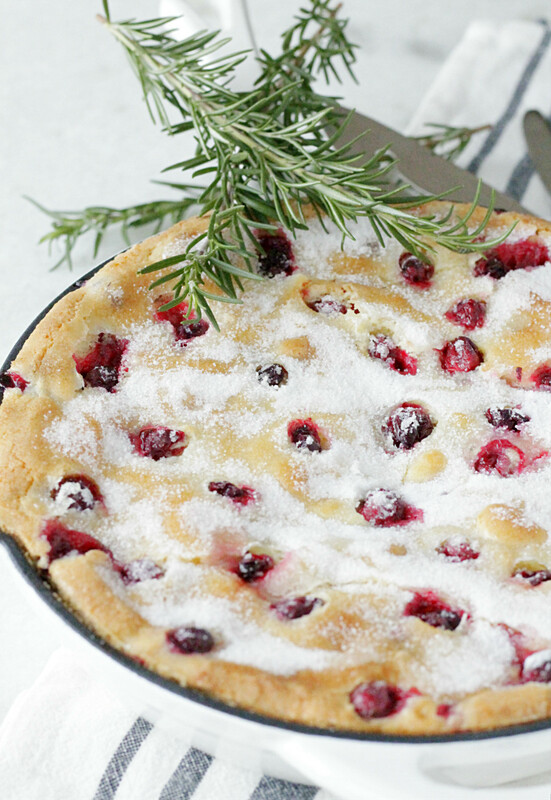 This Sugared Cranberry Cake is the holiday-perfect version of my most popular recipe of all time – French Strawberry Cake. 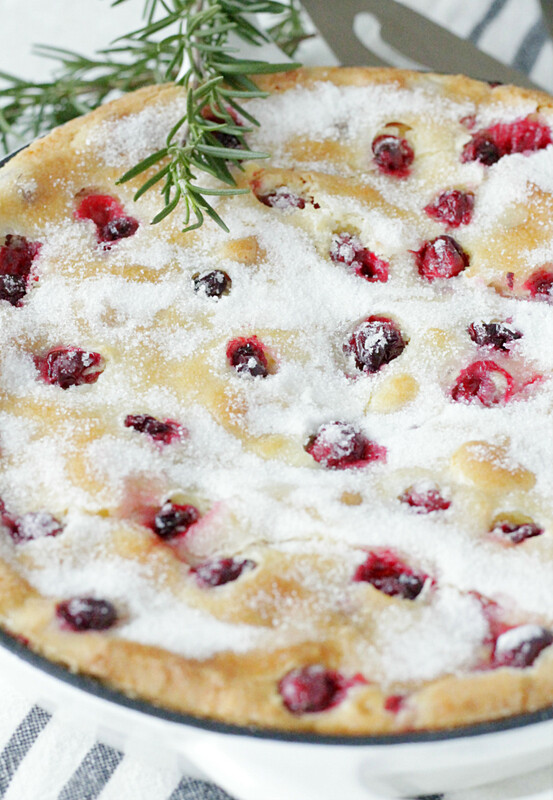 Sugared cranberries are actually a thing in case you don’t know. They are really pretty but they take some time to make. And in my experience they are just a little too tart. 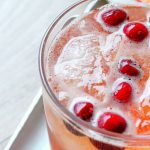 The sugar itself doesn’t penetrate to the middle of the cranberry with the sugared method. They get a little sweeter when baked in a cake. My French Strawberry Cake is so far my most viewed recipe of all time. It’s a terrific cake. Simple to make but with a stunning presentation. 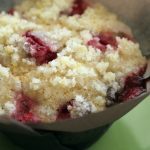 With the sugar topping it translates really well to the addition of cranberries. 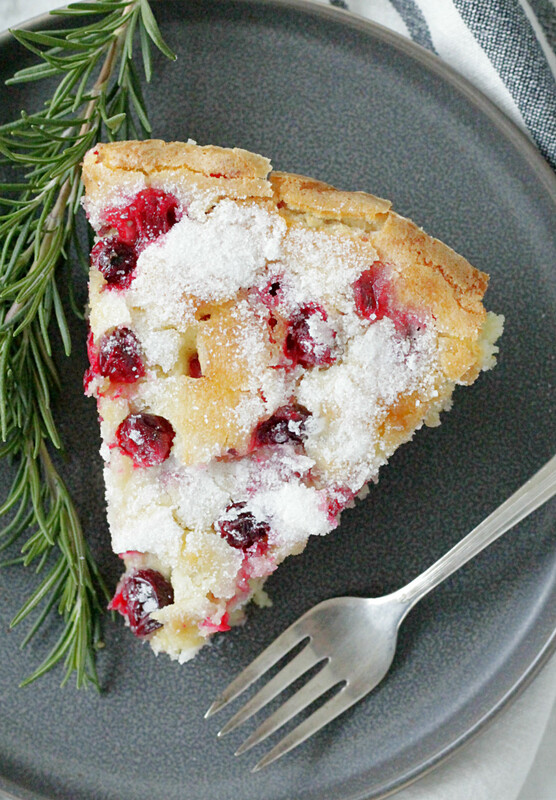 Sugared cranberries become the topping of the cake without any extra effort on your part. You can bake this cake in a 9-inch cast iron skillet and use that as the serving dish. Or you can bake it in a 9-inch round cake pan and slice it right out of the pan. It’s not quite as pretty to set on a buffet or your table that way so I’d suggest a ceramic baking dish to bake it in and serve from. This cake most definitely functions as a dessert. But it would be a pretty holiday addition to a brunch table with a breakfast casserole too. This is a cake that will have your guests asking for the recipe. Preheat oven to 350 degrees. 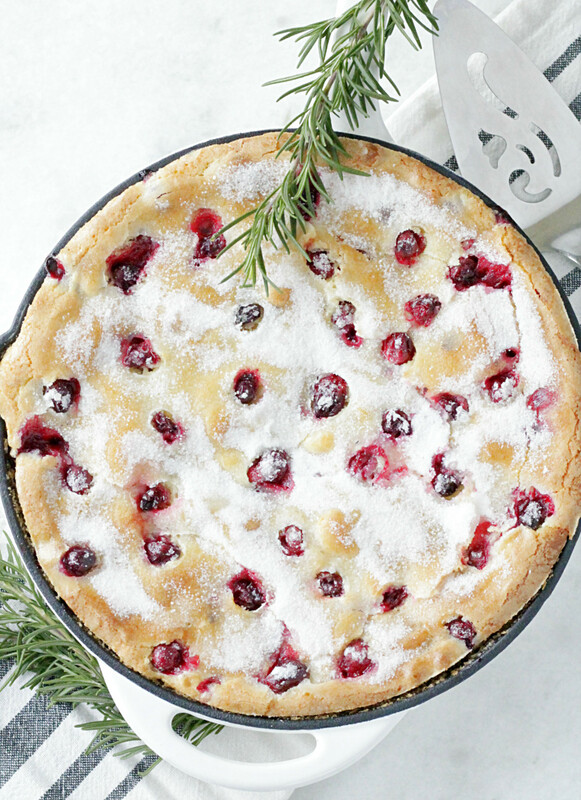 Spray a 9-inch cast iron skillet OR a round cake pan with cooking spray and set aside. In the bowl of a stand mixer, whip together the butter and 1 cup of the sugar until pale and fluffy, 5 to 7 minutes. Add the eggs, one at a time and beat well after each addition. Beat in the vanilla. In a medium bowl, whisk together the flour, baking powder and salt. Gradually add the flour mixture to butter mixture alternately with sour cream, beginning and ending with flour mixture, beating just until combined after each addition. Fold most of the cranberries into the cake batter. Spread the batter in the prepared skillet or cake pan. Evenly space the remaining cranberries (about 10-12) on top of the batter, pressing them in lightly to stick. Bake until a wooden pick inserted in the center comes out clean, 35-40 minutes. Let the cake cool completely in the pan and slice and serve the cake from the pan. Some people have reported needing to bake the cake longer than the recommended time of 35 - 40 minutes. Pans, skillets and individual ovens will all factor into the correct baking time. This is so sweet (in the good way) and it has the holidays written all over it. 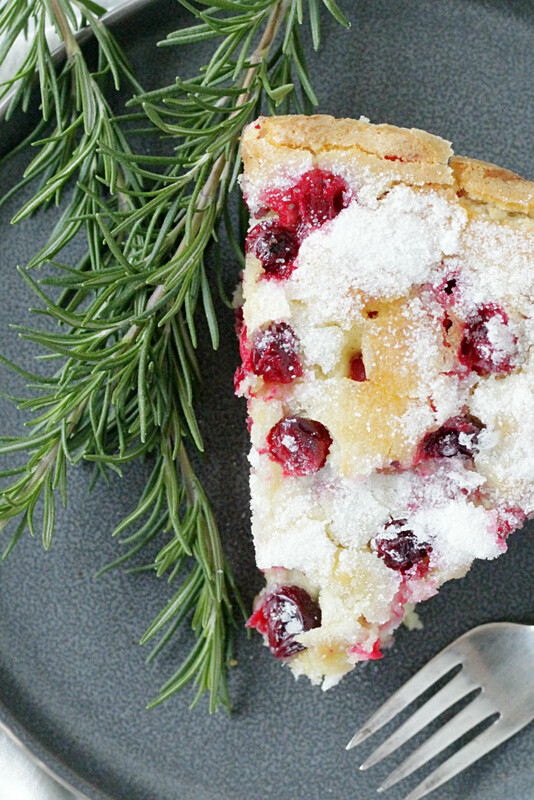 Great idea to make those cranberries sweeter in a cake. Thanks! This feels festive. I’d have that as dessert for Thanksgiving. 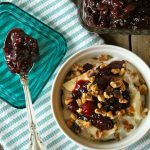 I’m a huge fan of cranberries so this would so be a treat. Saving for later. I love the look of this, definitely my kinda cake, simple but really tasty! This looks like a great desert for Thanksgiving, think the whole family will enjoy it. I agree. My whole family loved it! Can you make this cake ahead of time and then just warm up in the oven? or do you make the batter ahead of time and then put into bake when everybody is sitting down to dinner?